Odom Construction Systems, LLC, was honored to partner with Landmark Properties and Landmark Construction to bring The Mark to Athens. Work on The Mark began at the end February of 2016, and the scope of work for the project included the erection of prefabricated, light gauge steel panelized walls. Poor soil conditions resulted in initial scheduling delays. This would be devastating to most projects. However, the experienced, expert installation that Odom Construction guarantees with speed of erection, assured that non-negotiable move-in dates would be kept, and occupancy delays would not be an issue. Work for Odom Construction Systems was completed as the new year began. 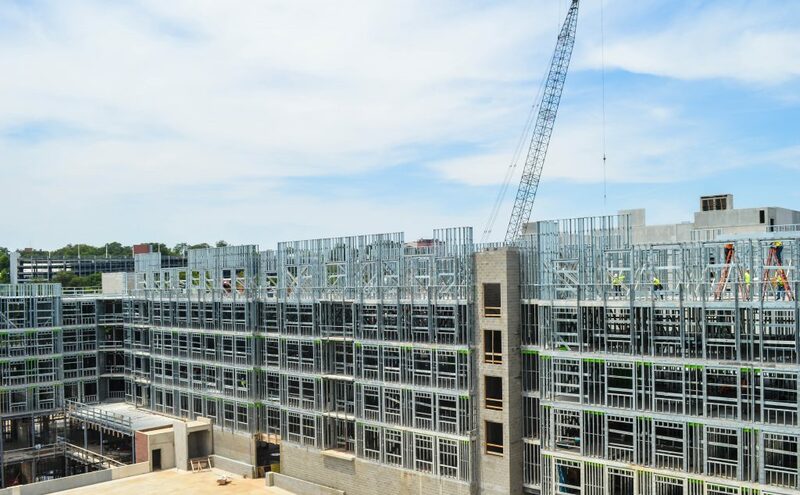 In a little less than one year, the walls for the 2 buildings, reaching up to 9 stories, for a combined 600,000 square feet were installed. The Mark will officially open its doors to residents Fall 2017. For more information visit The Mark at Athens.